Get some soft measuring tape and wrap around the top of your thighs. Ensure that you measure accurately, and measure both thighs just to be safe. You can measure in Centimetres or Inches. We understand that people come in all shapes and sizes. So we have made a Small size and a Medium size for our customers. The Small size is 16cm / 6in long. The Medium size is 20cm / 8in long. If you are around 6ft and taller we recommend a Medium size. If you are around 6ft and shorter we recommend a Small size. If you are a Medium height, you can choose a Small or Medium. If you are short please choose the Small size. If you are tall please choose the Medium size. 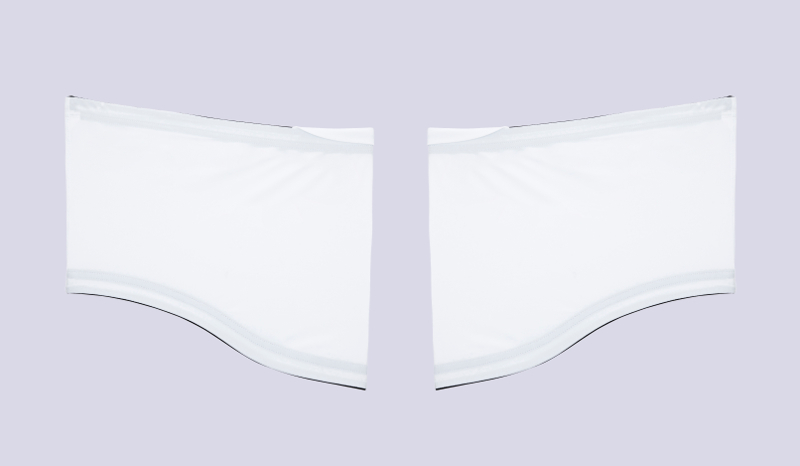 Protective Flap - Protects the inside of the thighs. Protects the integrity of the Thigh Guards. Ensures the product remains undamaged and long lasting. Stitch Line - This should be lined up and placed on the outside of your hip. Try and put it directly in the middle, of the outside of your hip. Silicone grippers - Grip onto your skin and keep your Thigh Guards in place during movement. Used in all high performance sports compression sleeves and sports apparel. Please allow 5-10 minutes for the silicone to completely grip to your body. 1. Fold the protective flap down, over the outside of the Thigh Guards. 2. Put the Thigh Guards on. Then pull the top of the Thigh Guards up, so they attach to your hip. You will notice the bottom of the Thigh Guards spreading down the lower legs. 3. Pull the bottom of the Thigh Guards up, so they are square and even. The Compensation System is now activated. This will allow you to sprint, jump, crouch, bend, sit, stretch. Perform any dynamic movement. No slippage, no sliding down. After many uses, you silicone grippers will eventually be covered with invisible dirt/dead skin cells. This will delay the silicone grippers from sticking to you skin immediately, leading to slippage during the first 10 minutes of usage. In order to keep your Thigh Guards working at their best we recommend you clean the silicone grippers after each use.